The ZOOFENSTER Tower is the tallest building in the City West district. With its imposing height of 118 m and 32 storeys it soars majestically above its neigh-bours. The impressive glazing on the upper facades of the Tower, which serves to provide fantastic panoramic views out over the capital, was the inspiration for the name ZOOFENSTER (meaning Zoo Window). Even at the planning stage its success is assured by its location, its concept and its specifications. A part of the building is already pre-let to the Hilton Hotel Group, who will open the first Waldorf-Astoria Hotel in Germany here in 2011. 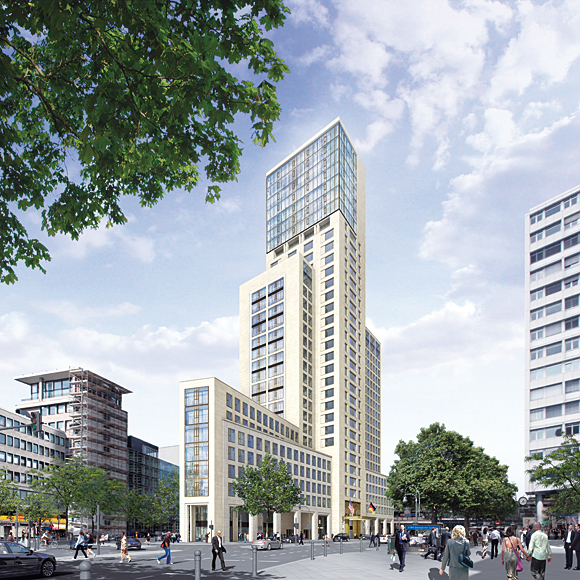 Besides the 5-star hotel with over 200 rooms and suites the ZOOFENSTER Tower will create a new prime location for high-quality offices and shops.